Cacharel has launched Amor Amor Electric Kiss, a new limited edition flanker to 2003′s Amor Amor. 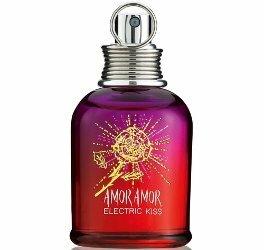 Amor Amor Electric Kiss features rhubarb, pink pepper, jasmine, rose, amber woods and patchouli, plus a bottle design that will glow under black light. Cacharel Amor Amor Electric Kiss is available in 30 and 50 ml Eau de Toilette. Why on earth would you want to expose your perfume to black light??? Black lights are still around! They are very handy in flashlight form, which can be used to see if your cat has been peeing outside of the litterbox. Probably TMI. LOL!! Good to know, maybe. Ewww hahahaha good to know; maybe I should buy one. Why not? Long-wave UV-A is hardly more activating than visible light. And it seems fun! They sometimes use black light on the dancefloor in clubs, but the only reason I can think of pulling out a bottle of perfume in that situation is to take the focus off my dayglo dandruff.